On September 11, 2001, nearly 3,000 people were killed in terrorist attacks at three sites in the United States. Most died in and around the World Trade Center in lower Manhattan, from the suicide collisions of two airplanes into the Twin Towers; some perished from a plane crashing into the Pentagon in Arlington, Virginia, across the Potomac River from the nation’s capital; and others in a thwarted attack and subsequent plane crash in a rural field in Shanksville, Pennsylvania. Hundreds of courageous first responders risked their lives to save others, many of them perishing in the performance of their sworn duties. On June 20, 2011, the U.S. Mint started accepting orders for a new silver national medal to mark the 10th anniversary of the September 11, 2011, terror attacks. With Public Law 111-221, President Barack Obama had authorized the “National September 11 Memorial & Museum Commemorative Medal Act of 2010,” allowing the minting and issuance of up to two million one-ounce silver medals in commemoration of the establishment of the National September 11 Memorial & Museum at the World Trade Center site. The medal was designed by U.S. Mint Artistic Infusion Program Master Designer Donna Weaver (obverse and reverse) and sculpted by medallic sculptors Phebe Hemphill (obverse) and Joseph Menna (reverse). It was struck in Proof format. On the obverse, Lady Liberty holds the Lamp of Remembrance, while behind her are two towers of light stretching into the sky. These elements “symbolize not only the immeasurable loss on that fateful day, but also the resiliency and triumph of those who persevered,” the Mint announced. The obverse legends are ALWAYS REMEMBER and the dual dates of 2001–2011. 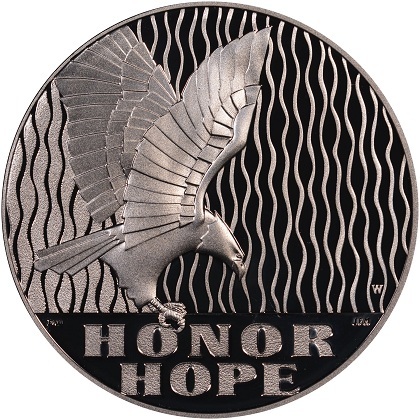 On the reverse is an eagle, symbolizing the strength of the survivors, their families, emergency responders, and the nation as a whole, against a backdrop of cascading water. The flowing water represents peace, serenity, healing, and the continuity of life. The reverse legends are HONOR and HOPE. The Mint announced that approximately half of the medals would be struck at the West Point Mint (featuring the W mintmark) and half at the Philadelphia Mint (with the P mintmark), with customers able to purchase one or both options. No household order limit was established. Sales concluded on December 17, 2012. A $10 surcharge collected from the sale of each medal was paid to the National September 11 Memorial & Museum, a private not-for-profit organization overseeing the design and funding of the memorial and museum at the World Trade Center site. The funds supported the museum’s operations and, once it was completed, its maintenance. 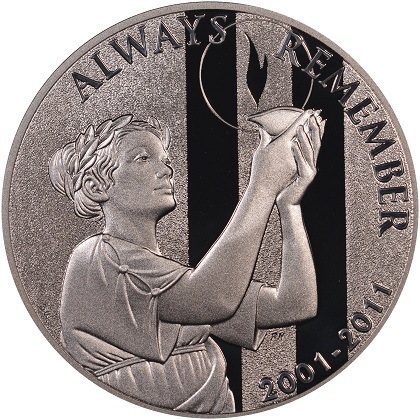 “This medal’s design is intended to exalt the memory of those who sacrificed their lives or were injured,” said United States Treasurer Rosie Rios at a launch ceremony at the 9/11 Memorial Preview Site on June 20, “and the families who continue to show dignity and strength in the face of terrible loss.” In total, the two mints (Philadelphia and West Point) distributed just over 177,000 pieces, raising nearly $2 million to support the Memorial & Museum. Personally, I remember 9/11/2001 as if it were yesterday. I studied the September 11 national medals as I researched for my upcoming book American Gold and Silver: U.S. Mint Collector and Investor Coins and Medals, Bicentennial to Date. In my opinion they’re beautiful and elegant works of art that commemorate American bravery and survival. They recognize the past, but with an eye toward the future. I understand that some hobbyists find the subject matter too painful, and the memories too fresh, to collect these medals. Some object to them being minted at all, on philosophical grounds. What’s your opinion of these medals? Dennis Tucker is the Publisher at Whitman. I always liked the medal. It is the case that they did not sell very well and that was because lots of collectors were unhappy with the design and felt it was too symbolic or that the symbolism was ambiguous to them. Some people wanted a more literal approach that depicted the Twin Towers and Pentagon, while others preferred the more hopeful approach of the chosen design. But I don’t recall them being controversial in the sense that people felt the should not be issued. It was the design that was the issue, not the subject as I recall. What philosophical argument was made against the medals being issued? May I please reproduce this piece in Mintmark, the magazine of the Numismatic Society of Auckland. The terror of 9/11/2001 will be forever etched in my soul. I collected these medals as a keepsake reminder of the events that took place that day; both for me and for future generations. We must never forget. There is significant symbolizing of events and emotions in the design and it is spot on subject and eloquently executed. I believe sales suffered because the legistration strayed too far from the usual commemorative pattern of uncirculated and proof coins. An uncirculated and proof medal along with a bronze option would have performed better than two proofs. Good point, a coin would have done better as not as many people collect medals, and people found it odd to have medals with mintmarks, which made them seem more like coins. The decision to issue commemorative medals rather than legal tender coins doomed this program to the margins of numismatics. I collected these medals from both mints and had them graded by PCGS, knowing that their value in my lifetime will never be much above the melt value of the silver they contain. I plan to pass them along to our children and grandchildren to help keep the next several generations aware of what happens when we become complacent about our national security. It seems likely that, by the 20th or 25th anniversary, the Mint will receive the necessary congressional authorization to do it right and issue legal tender commemorative coins – I believe that such an issue at one of those anniversaries will be well received.